I have been looking for an edging to add to my Tunisian Roses Afghan. I found a PIN of a Crochet Flower Edging that I thought would be perfect for my afghan. The tutorial is in another language, google translate doesn't help much and the pictures were not in order. This is what I figured out for this stitch and will be using for my afghan. Crochet Flower Edging Pattern Notes..
Yarn: Ice Yarns - Super Baby 50 yards or less. v-st - (dc, ch1, dc) in same stitch. You can use any weight of yarn with the recommended hook size on the ball band or pattern. Edging is worked in multiples of 3. If you already have a piece you would like to add on to that is in multiples of 3 skip the building a foundation section. Row 4 & 5: rep Row 3. Already have a foundation? Start here.. Need help with the corners? Want to add the Crochet Flower Edging to an afghan and not sure how to work the corners? Check out how HERE. Crochet Flower Edging Video Tutorial..
Have you made your own Crochet Flower Edging? Please share your pictures on my Facebook WALL or hook up your project on Ravelry. Thank you!! Thank you!! I had fallen in love with the pattern you were speaking of at the beginning and in the midst of trying to decipher it. My Tunisian baby blanket will now have a beautiful edge! Yay! Wow! Thanks so much for your generous patterns gift! You are so creative – and prolific! I can’t wait to start something; I’m especially interested in the beautiful tulips since my ancestors are all Dutch. Thanks again. Thanks for the link to written directions – I don’t do well with videos. I am wanting to try this on a baby blanket. 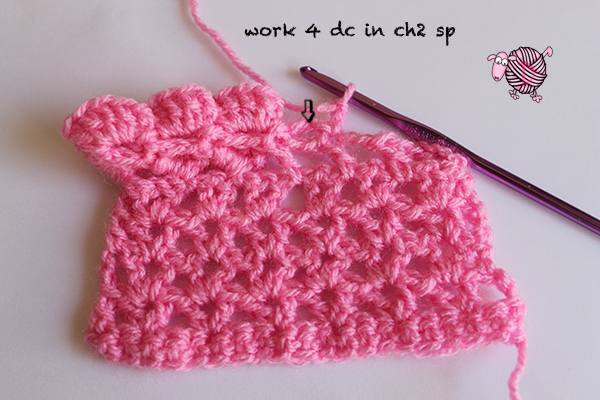 The pattern I used was a double crochet pattern. How do I incorporate your tulips into my blanket considering it is double crochet stitch and not a v stitch? You’d have to work an edging around your work. Off hand I believe it’s worked in multiples of 3. Beautiful! I’ll have to watch the video several times before I feel comfortable trying to stitch this as a sample. It really helps to see this pattern worked to fully understand its construction! Thank you so much! I have been looking for a unique edging to put on a shawl that I am making for my daughter. This is PERFECT! Thank you so much for sharing! I really, really appreciate it. Please tell me if this can work as a boarder for a corner to corner blanket all around the entire blankwt? Please PLEASE help.